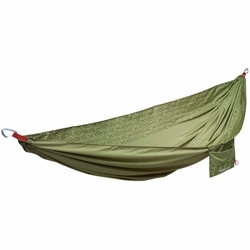 Therm-a-Rest Slacker Double Hammock. The new Slacker Double Hammock is the perfect answer for anyone looking to share a little hang time, or to just enjoy a little extra space. It’s got a generous cut for two and is made of the same soft polyester fabric as the single. Our unique fabric offers a great, next-to-skin feel without the pressure points associated with nylon hammocks. It stuffs into its own attached pocket that doubles as a place to stash a book, tablet or sun glasses, should your slacking escalate to full-on snoozing.